Here are photos sent in by a reader, Dominic, of some of his “bicolor loop magic” braids–in a great hemp yarn as well as waxed cotton. Not only are they beautiful braids, but the knotting he’s done with them (and other cords) is really inspiring–I’ve got to get going on learning more knots! 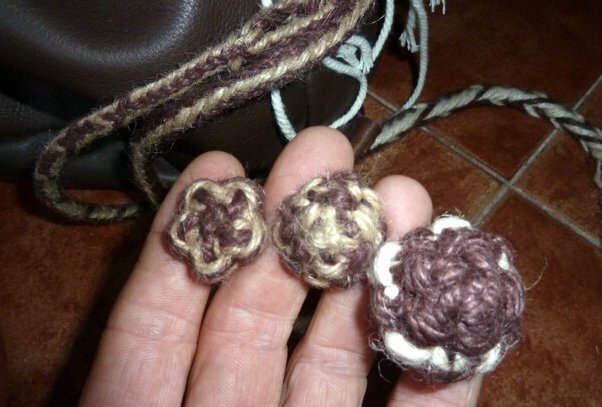 Above is his photo of 3 star knots, showing how differently they turn out depending on how he manages the strands. 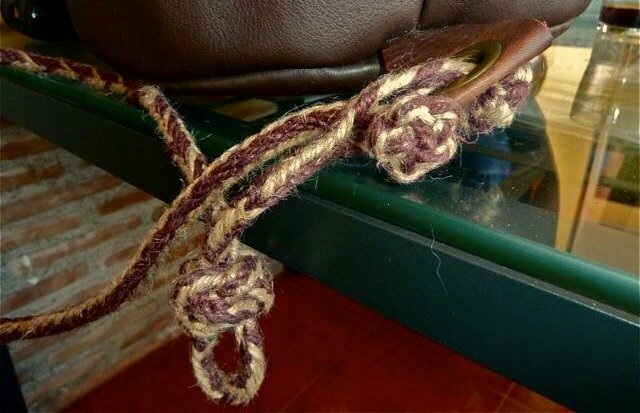 The photo below also shows more of the braid and how it attaches to the bag. These braids and knots look fantastic in hemp! 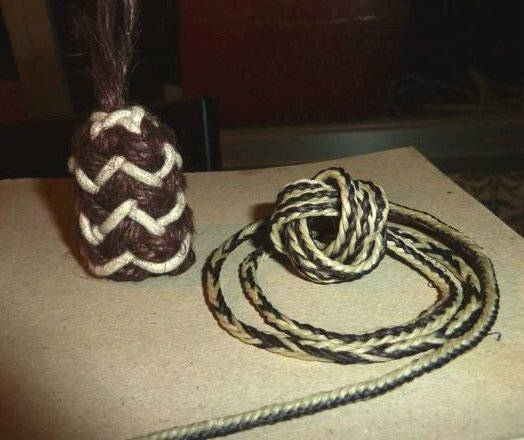 Dominic says he used intact loops to form the knot on the left (upper photo) and controlled the color arrangement that way, whereas the other two knots were done with the strands randomly assorted, probably after trimming off the tied ends of the loops. 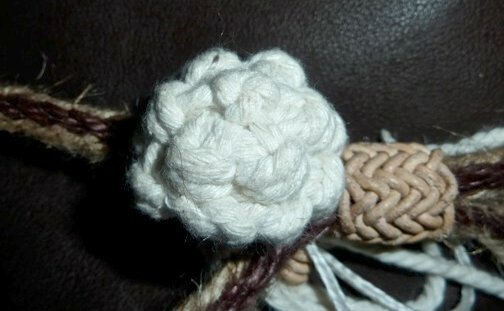 I just looked at a star knot tutorial and it seems to be used for finishing a braid. Makes a beautiful, button-like end. I often start my own braids with a loop, this star knot would be a great way to finish for a bracelet or other type of braid that needs a closure. He says the Pineapple Turks head is “one turks head nested within another.” It’s beyond me how that is done, or how you would add a contrasting element to a knot. The dark brown is that great hemp again, probably the heavier weight 4-ply (?). Dominic didn’t specify, but the smooth contrast cord looks like the leather in his 3rd photo. 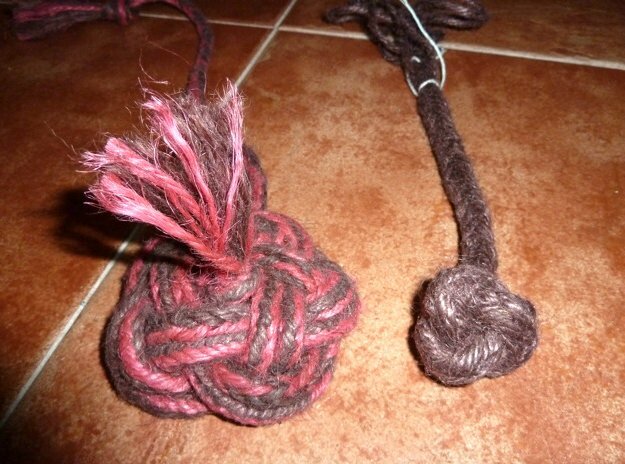 …a couple of extra passes on an overhand [knot]… I like the fact that people think turks heads are hard when actually everyone knows at least one – the overhand knot. It is braided with waxed cotton for leather workers. Weird stuff but you can clean most of the wax off if you like. I intend to assiduously study that knot! And look into how/ where to find waxed cotton. I have a few kinds of hemp–really like the texture. Also the feel of a hemp braid after it has been washed (brutally, in hot water and detergent*) is wonderful, really supple and bouncy. Linen, too. Much more life to them than other fibers. *re: washing braids–test the yarn/cord for color fastness first. Photos of braids made by others may not be shared in any way without explicit permission from the maker of the braid. See full copyright restrictions and permissions at the bottom of the sidebar (if you are on a small screen device, the ‘sidebar’ may appear somewhere other than at the side of the screen).